Summary: Emery-Dreifuss muscular dystrophy is a rare disorder characterized by childhood onset of contractures, humeroperoneal muscle atrophy, and cardiac conduction abnormalities. This report presents the cases of two brothers with this dystrophy in whom bilateral hypomyelination of the deep periatrial white matter was noted. 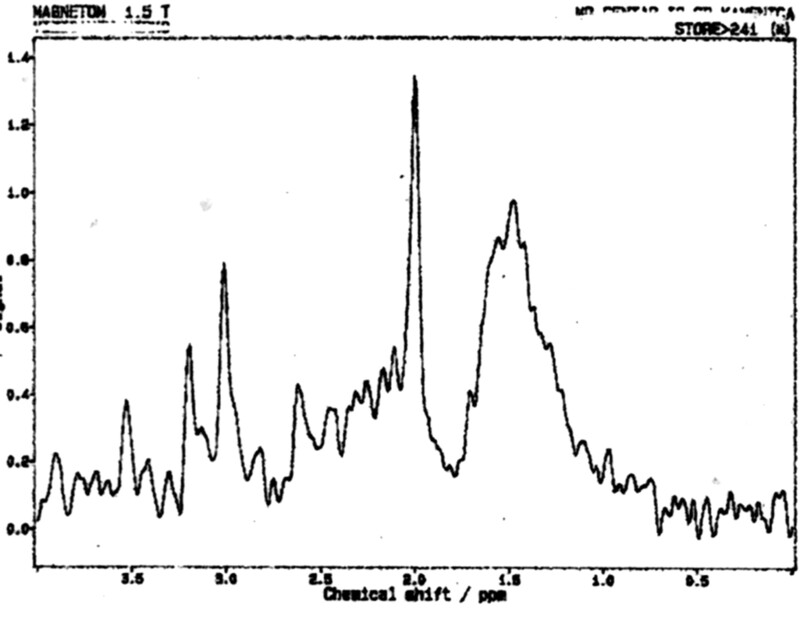 In the hypomyelinated regions, a prominent peak centered at 1.5 parts per million was present on short-TE MR spectra likely representing prominence of proteolipids in the macromolecular region. Major peaks (n-acetyl-aspartate, creatine, choline, and myoinositol) were normal. With respect to muscle changes, atrophy of the medial head of the gastrocnemius muscle was noted at MR imaging, and phosphorus spectroscopy of this muscle revealed decreased phosphocreatine and inorganic phosphate peaks. Emery-Dreifuss muscular dystrophy is a rare disorder characterized by childhood onset of contractures, humeroperoneal muscle atrophy, and cardiac conduction abnormalities (1–8). To our knowledge, only one report of the MR imaging findings of crural muscles (1) and no report of brain changes in this disorder exists in the literature. In this case report, we present imaging findings in the brain and muscle in two siblings with Emery-Dreifuss muscular dystrophy. The patients were two brothers: a 15-year-old adolescent and an 11-year-old boy. The older sibling was preterm at birth. Head holding in supination was at 4 months. He sat up at 10 months of age, and walked at 22 months. Early psychomotor development was decelerated. He had a rigid spine. There was generalized muscle weakness with pronounced weakness of the neck flexors. Muscle contractures were noted in the shoulders, hips, talocrural region, and right elbow. A mild progression of the disease was evident by the age of 15 years. Supraventricular arhytmia was disclosed by electrocardiography. Creatine phosphorus-kynase level in the blood was 509 U/L (normal value, 134 U/L). Muscle biopsy revealed changes consistent with dystrophic myopathy. The possibility of a structural myopathy was excluded by histochemical stainings. The diagnosis of Emery-Dreiffus muscular dystrophy was established. The 11-year-old boy was born at term. He had cricopharyngeal achalasia, which spontaneously regressed. He sat up at 6 months of age and walked at 16 months. Early psychomotor development was normal. Rigidity of the spine was relatively mild. He had hypotrophy of the shoulder muscles. No generalized muscle weakness or contractures were noted, although there was mild weakness of the anterior tibial and lateral crural flexor muscles. His feet were excavated. There was no apparent progression of the disease up to the age 11 years. An electrocardiography was normal. Creatine phosphorus-kynase level in the blood was normal. Muscle biopsy revealed normal findings. The clinical findings in particular were consistent with the diagnosis of Emery-Dreiffus syndrome. MR imaging examinations in both siblings showed high-signal-intensity lesions in the deep periatrial white matter bilaterally (Figs 1 and 2). In addition, in the older brother, encephalomalacia was present in the temporal lobe (Fig 1). The medial head of the gastrocnemius muscle revealed atrophy in both patients. Proton MR spectroscopy was obtained in both brothers with single volume (in a 12.5 × 15 mm3 voxel) at the lesion sites in the deep periatrial white matter (with point-resolved spectroscopy [PRESS] TE = 135 ms, and stimulated-echo acquisition mode [STEAM] TE = 20 ms; TR = 2000 ms in both). Spectrum with PRESS TE = 135 ms was normal with respect to the major peaks n-acetyl-aspartate (NAA), creatine (Cr), and choline (Cho). These major peaks, and myoinositol also appeared to be normal in the spectrum with STEAM TE = 20 ms. In the spectrum with STEAM TE of 20 ms, however, a prominent peak centered at 1.5 parts per million (ppm) was evident in both patients (Fig 3). This peak likely represented prominence of proteolipids in the macromolecular region at the periventricular hypomyelinated lesion sites. Phosphorus (P31) spectroscopy of the gastrocnemius muscle was performed in the older brother, which revealed decrease of phosphocreatine (PCr) and Pi peaks at both relaxation and contraction. T2-weighted image obtained in a 15-year-old boy reveals bilateral high-signal intensity changes in the periatrial white matter, likely representing hypomyelination. A region of encephalomalacia is noted in the right internal capsule. T2-weighted image obtained in an 11-year-old boy reveals bilateral high-signal intensity changes in the periatrial white matter similar to the older brother. Proton MR spectrum (STEAM; TE = 20 ms, TR = 2000 ms) obtained in the 15-year-old boy reveals normal peaks of NAA, Cr, Cho, and myoinositol. A prominent peak is evident, centered at 1.5 ppm, likely belonging to proteolipids. Spectroscopy of the younger brother revealed identical changes. Emery-Dreifuss muscular dystrophy mainly has two forms: autosomal dominant and X-linked. The onset of the disease is usually between the ages 5 and 15 years. The clinical findings consist of slowly progressing muscle weakness and atrophy, especially in the humeroperoneal region; muscle contractures, especially in the neck, elbows, and ankles; and cardiac conduction abnormalities. The patients and carriers are at risk of sudden death due to cardiac arrhythmias (1–8). To the best of our knowledge, there is only one MR imaging report on skeletal muscle involvement in Emery-Dreifuss muscular dystrophy. In that study, Mercuri et al (1) investigated nine patients and found that especially the medial head of the gastrocnemius muscle had prominent atrophy. We have noted the same finding in our own patients. 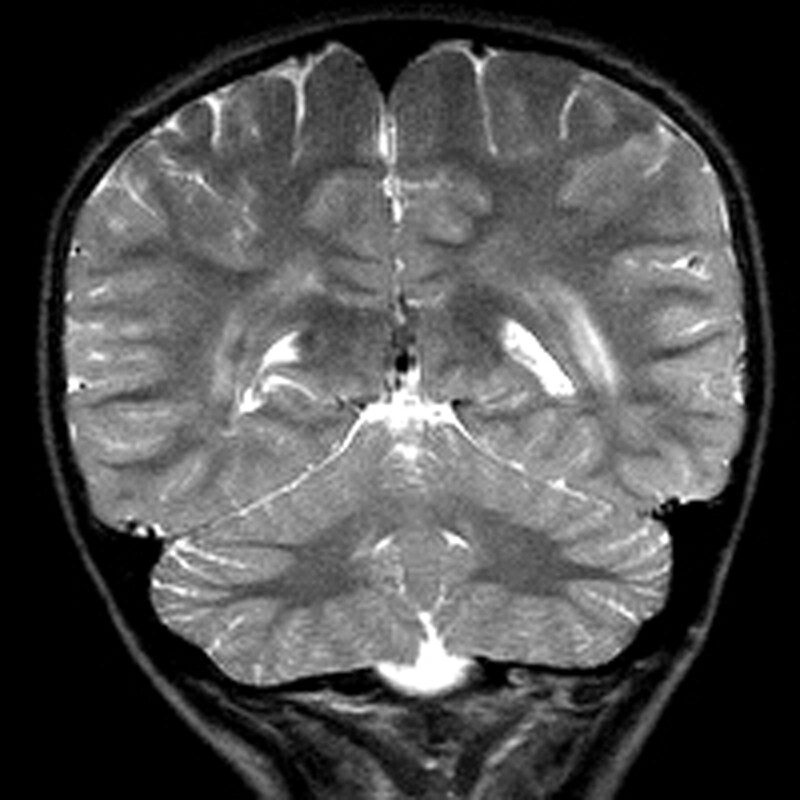 Congenital muscular dystrophies associated with brain changes that are recognized in the imaging literature comprise four main groups: pure congenital muscular dystrophy (with merosin-positive and merosin-negative subgroups); Fukuyama-type congenital muscular dystrophy; muscle-eye-brain disease; and Walker-Warburg syndrome (9, 10). In pure congenital muscular dystrophy, the main imaging finding is widespread delayed myelination or hypomyelination of the white matter. Fukuyama-type congenital muscular dystrophy is mainly associated with delayed myelination of the white matter and neuronal migration disorders. Muscle-eye-brain disease manifests with delayed myelination of the white matter, impaired visual fixation present from birth, and neuronal migration disorders. Walker-Warburg syndrome reveals prominent hypomyelination of the white matter, neuronal migration disorders, and eye abnormalities (9, 10). 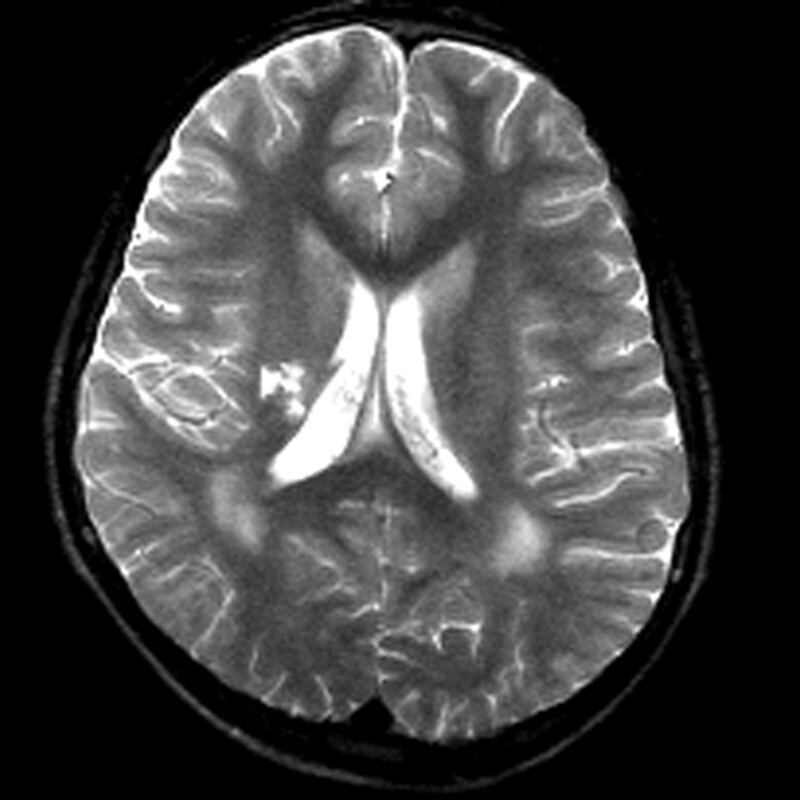 The white matter lesions in the above-mentioned syndromes are usually prominent. In our patients with Emery-Dreifuss muscular dystrophy, however, high-signal intensity lesions, which were confined to the deep periatrial white matter, were present. These likely represented areas of hypomyelination (Figs 1 and 2). In these regions the major peaks (NAA, Cr, Cho, and myoinositol) appeared normal at spectroscopy. With respect to the nature and importance of the prominent peak centered at 1.5 ppm noted on short-TE spectroscopy (Fig 3), the following may be considered. In light of the pathophysiology of Emery-Dreifuss muscular dystrophy, there may be prominence of the macromolecular region as a result of more basic myelin components in the periventricular areas of signal intensity abnormality, and the prominent peak at 1.5 ppm was likely representative of prominence of proteolipids in these macromolecular regions. Finally, the findings on P31 spectroscopy of the gastrocnemius muscle were decreased PCr and Pi peaks, noted at both relaxation and contraction. This likely represented relatively low capacity for aerobic metabolism of the muscle because PCr resynthesis is controlled by aerobic metabolism and mitochondrial creatine kinase (11). Brain MR imaging changes in Emery-Dreifuss muscular dystrophy included hypomyelination of the deep periatrial white matter in two siblings. In the hypomyelinated regions, on short-TE spectroscopy, a prominent peak centered at 1.5 ppm was present, likely belonging to proteolipids, whereas major peaks were normal. With respect to muscle changes, atrophy of the medial head of the gastrocnemius muscle was shown by MR imaging and P31 spectroscopy of this muscle revealed decreased PCr and Pi peaks.